I have a big confession to make. I've decided to leave Nick for my new secret lover, Pinterest. My old secret lover was Chicken McNuggets, but now that I'm on this god forsaken diet I had to break up with them. I'm going to introduce Pinterest to my kids later this week, and explain that it's just like the old daddy but this one gives mommy awesome ideas for outfits, food and home decor. Many of you are already on Pinterest and many are not. And that's okay if you're not. Just kidding. If you're not on Pinterest you're what we in the biz call a "loser". You're a huge pain in marketers asses because you won't jump on the new idea bandwagon. What's wrong with you? Don't you want to know how to make the honey sesame chicken cooking in my crock pot right this moment or make multi-colored bath bubbles? But just in case my compelling argument of calling you a loser hasn't encouraged you to get on Pinterest, don't worry. Because once a week I'm going to bring Pinterest to you, my loser friend. I've been pinning up a storm around here and making lots of awesome things. Every so often I'll share one of my successes or failures. And, you can even email me and share your favorite pins and I just might feature you on my blog. Originally I was going to do it every Wednesday and call it Winterest, but my life is so crazy right now that I can't even commit to taking a poop, much less a weekly segment. You can also follow me and my boards, if you want. So here's your first one. 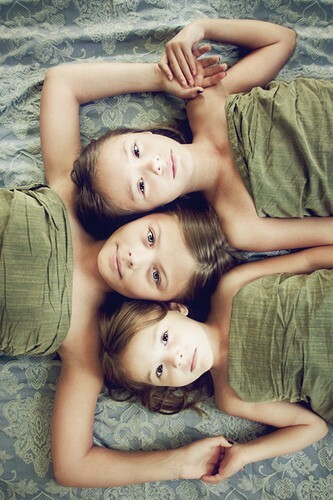 A beautiful photograph of three girls that I thought would be awesome to try with my girls and maybe blow up and hang in the living room. And right about here is when I remembered that taking a picture of all three girls is a pipe dream. If only I knew how to use Photoshop. Gah! I love Pinterest. Unfortunately. And I just followed you ... which means more time sucked into the vortex. Pinterest is awesome! I am pretty sure that I have a "create a new board" addiction! Now all I need is some time to make these great ideas. That is the one thing they neglected to tell you, you will be so addicted to the site that you will have no time to create the goods! I've been meaning to try Pinterest, it's on my to-do list. I'm a graphic design student (perpetually, it seems) so if you can get three good individual shots I can 'shop' them together for you, lol. Seriously, hit me up and I will come take pictures of your beauties. PLUS, I know Photoshop, so even if we get a series of images where each of them is looking at one point or another I can put it all together to look like we rocked it.